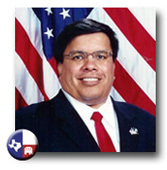 Carlos “Charlie” Garza was elected in 2010 to represent the citizens of District 1 of the State Board of Education. He currently serves as vice chair of the board's Committee on School Initiatives. Garza is an assistant principal in the Clint Independent School District in El Paso. He has served as an education administrator in college, high school, middle and elementary school. Garza earned his undergraduate degree from Southern Illinois University at Carbondale, a Master’s Degree from Old Dominion University, did doctoral work at The George Washington University and completed his course work for his superintendent certificate at The University of Texas at El Paso. His education-related honors include selection to the National Who’s Who Among Teachers, Youth Advocate of the Year, Best Student Role Model, and coach of the Virginia High School League Debate State Champions. Following his graduation from Harlingen High School, he earned a nomination to the U.S. Naval Academy, but opted instead to enlist and served in the Navy’s submarine community. During his military service, Garza served on the staff of the Commander, Submarine Force Pacific Fleet and Submarine Force Atlantic Fleet. He earned fifty-four letters of commendation, six Navy and Marine Corps Achievement Medals, and the Navy Commendation Medal. As a member of the State Board of Education, Garza represents the counties of Bandera, Brewster, Crane, Crockett, Culberson, Dimmit, Edwards, El Paso, Hudspeth, Irion, Jeff Davis, Jim Hogg, Kerr, Kimble, Kinney, La Salle, Loving, Mason, Maverick, Menard, Midland, Pecos, Presidio, Reagan, Real, Reeves, Schleicher, Starr, Sutton, Terrell, Upton, Uvalde, Val Verde, Ward, Webb, Winkler, Zapata, and Zavala. Although State Board of Education members are normally elected to a four-year term of office, all seats will be up for election in November 2012 due to redistricting.